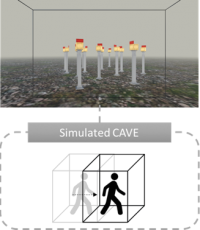 Would the rec­tan­gu­lar ref­er­ence frame of a CAVE help to reduce dis­ori­en­ta­tion and improve nav­i­ga­tion per­for­mance in VR? 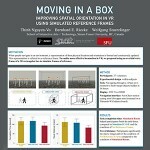 Here, we show that simply pro­vid­ing the rec­tan­gu­lar ref­er­ence frame of a room (as a simple wire­frame cuboid), but not a CAVE improved nav­i­ga­tional search performance. Despite recent advances in vir­tual real­ity, loco­mo­tion in a vir­tual envi­ron­ment is still restricted because of spa­tial dis­ori­en­ta­tion. Previous research has shown the ben­e­fits of ref­er­ence frames in main­tain­ing spa­tial ori­en­ta­tion. Here, we pro­pose using a visu­ally sim­u­lated ref­er­ence frame in vir­tual real­ity to pro­vide users with a better sense of direc­tion in landmark-free vir­tual envi­ron­ments. Visually over­laid rec­tan­gu­lar frames sim­u­late dif­fer­ent vari­a­tions of frames of ref­er­ence. We inves­ti­gated how two dif­fer­ent types of visu­ally sim­u­lated ref­er­ence frames might ben­e­fit in a nav­i­ga­tional search task through a mixed-method study. Results showed that the pres­ence of a ref­er­ence frame sig­nif­i­cantly affects par­tic­i­pants’ per­for­mance in a nav­i­ga­tional search task. Though the ego­cen­tric frame of ref­er­ence (sim­u­lated CAVE) that trans­lates with the observer did not sig­nif­i­cantly help, an allo­cen­tric frame of ref­er­ence (a sim­u­lated sta­tion­ary room) sig­nif­i­cantly improved user per­for­mance both in nav­i­ga­tional search time and over­all travel dis­tance. Our study sug­gests that adding a vari­a­tion of the ref­er­ence frame to vir­tual real­ity appli­ca­tions might be a cost-effective solu­tion to enable more effec­tive loco­mo­tion in vir­tual reality.